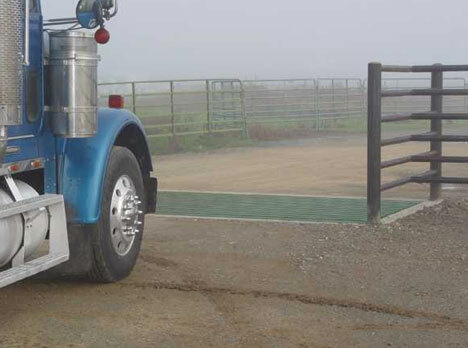 Cattle guards save time by allowing any type of vehicles easy access to farm and ranch land. Gates and latches are no longer necessary to keep your cattle inside, and the need to get in and out of a vehicle to open and close those gates is also eliminated. Cattle guards give vehicles free and easy access to the road while keeping your livestock in their pastures and lots. When purchasing a cattle guard, you will want to look for one of the highest quality for the longest life. Make sure any cattle guard you purchase uses heavy wall steel pipe and extra thick steel channel construction. In addition, the ends of the steel pipe must be capped. This will prevent rust and corrosion. The amount of weight the unit will bear is also an important consideration. The cattle guard you purchase must be sturdy enough to safely handle fully loaded tractor-trailers and any other vehicles that are legal on public highways. When you purchase a high-quality cattle guard, you are investing in a unit that will need minimal maintenance and fulfill its purpose for decades. Standard cattle guards are constructed with either round or square steel tubing, and are known as "flat cattle guards." This type of cattle guard can come with optional wings, an integral box, a removable box, or a cleanout line. Flat cattle guards are inserted into a hole in the ground using a cement form. There are some important differences between cattle guard styles. The boxed style cattle guard will lie on top of the ground, instead of inserted in it, but it has a gravel underlayment for water drainage. When this type of boxed cattle guard is installed, soil mixed with gravel must be pushed up to the height of the box on both sides. In effect, this forms a ramp on either side of the cattle guard for vehicles to easily drive over it. The box eliminates the need to first dig a hole and pour in the cement form. Both the boxed and the flat styles are equal in strength and durability. Consider purchasing a flat cattle guard built with a removable box, for purposes of cleaning. Over time, the hole beneath the cattle guard will fill up with dirt, leaves, or other debris. If your cattle guard has a removable box, the cattle guard can simply be lifted out of the box with a pallet fork, and the box can be cleaned out. If the area you are installing the cattle guard has loose earth, you may need to put some support under the cross beams as well. Cattle guard wings are another useful feature. They prevent your cattle from jumping the corner of the guard. Wings are used with barbed wire fences. If you already have a full height fence along the width of the guard, that will work effectively, but it cannot be just a flimsy 3 strand barbed wire. You need to have a fairly substantial fence. Although cattle are not all that smart, they can cut the distance in half and hop 3 feet. Having fencing along the entire width of the cattle guard prevents this. A full fence along the width will be a more cost effective option than the cattle guard wings, but if your fence is barbed wire, the wings are your best and safest option. Another option is bolt-on wings. Although the product cost is higher, you will make it back by saving on the shipping cost, especially if you need more than one set. A flat cattle guard with bolt-on wings can be shipped in a box van. This is much less costly than shipping via flat-bed trailer, which is required for the fixed wing cattle guards. Cattle guards come in varying widths, depending on the width of the road and the vehicles that will need to traverse it. The longest length cattle guard currently manufactured is 20. Building a longer one creates all kinds of transportation and installation issues, and if removal and cleaning become necessary, the unit will be really unwieldy. If a longer span is needed, the problem is easily solved by installing two cattle guards, end-to-end, and bolting them together. Boxed cattle guards are built from regular flat cattle guards as their base. Then a steel skirt is welded around the sides to keep dirt from creeping in underneath and clogging them. The guards are engineered to be placed on top of the ground without any footings or a vault. To complete the installation of a boxed cattle guard, a dirt ramp will be created on either side. Because they are not installed in the ground, they can move and shift over time. For this reason, boxed cattle guards are a better choice for temporary use, for instance a construction site washouts, or areas that do not have a lot of vehicle traffic. Although these cattle guards are not installed in the ground, they are built to withstand the weight of a fully loaded tractor-trailer. The primary use for cattle guards is keeping your cows inside your property. However, they do have other uses in construction sites and oilfields. They are also sometimes used to keep deer out. A deer will easily jump a 6 foot cattle guard. The most practical way to make a cattle guard wide enough to deter deer is to put two cattle guards in series, creating a 12 feet that the deer cannot jump. However, the entire 12 feet of the cattle guard must be fenced on both sides for this to be effective, otherwise the deer will cross at the ends. Cattle guards can be bolted together fairly easily. Many ranchers reported the 12 foot width to be effective with most deer, but particularly large or agile ones might just be able to jump that distance. However, there are no deer who can leap across a 16 foot span. When it comes to using cattle guards for horses, this is not recommended. A horse's hoof is much more slender than a cow's and can easily get caught in the cattle guard. A horse is in danger of breaking an ankle or leg if it tries to cross a cattle guard. If you have horses, the regular livestock gate is the recommended option. Mules are a little more sure-footed than horses and may not be deterred by the cattle guard at all. Consider all of your livestock before making your purchasing decisions. Cattle guards are useless to keep dogs in. They will walk right across a cattle guard without hesitation. Cattle guards are also not effective for keeping sheep and goats in, or keeping wild hogs out. Hogs are surprisingly smart. They will find a way onto your property by carefully walking across the cattle guard channels . Cattle guards have another common use that has nothing to do with livestock. They make extremely effective wheel washes in construction and oilfield settings, allowing easy washing of heavy equipment prior to transportation. Equipment can simply be driven up onto the cattle guard and hosed down. Rated cattle guards will meet the specifications needed for state and federal requirements such as DOT, BLM, USFS, NP, and US Military installations. 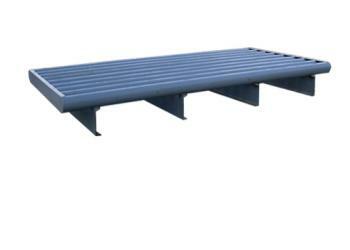 These cattle guards are the necessary quality to be used for commercial applications including mining, forestry, agriculture, and petroleum production. Rated cattle guards are the product of choice for residential usage where city, county, or state regulations require the HS20 rating. Certified structural steel is used in the manufacture of HS20 rated cattle guards. HS20 cattle guards are intended for government bids. To ensure they meet the proper commercial standards, these guards must be certified by an independent engineering firm. If you are wondering if these are the guards you need, know that for use on private land, buying standard cattle guards will save you thousands of dollars. They are identical in size and are made from the exact same heavy duty materials. The only thing they are missing is the certifications and paperwork required by government agencies. If purchasing a non-rated guard for a private drive, a standard cattle guard is the best choice. The foundation is an important consideration when purchasing cattle guards. For a permanent cattle guard, a full concrete vault with 6" walls will be installed. The depth of this ault will be determined by both soil type and drainage considerations. Inside the vault, a concrete footer is poured for the beams to rest upon. This type of installation uses the least expensive flat cattle guard. It is easy to construct and install and will last the longest. To install the foundation, a trench one-foot-deep and 1 foot wider than your cattle grid must be dug. Pour a 6-inch-wide wall around all four sides to prevent the earth from collapsing into the guard under the pressures of heavy vehicle traffic. In the bottom of the trench, pour a concrete footer, 12 inches wide and 18 inches deep under each beam of the cattle guard. Install large PVC pipe through the forms to provide drainage. Most designs do not utilize pipes; instead they dig out and fill with crushed rock to form a French drain. If the drainage is particularly bad, run both a pipe and a French drain out into the surrounding ground. Proper drainage will prevent water and rust problems. 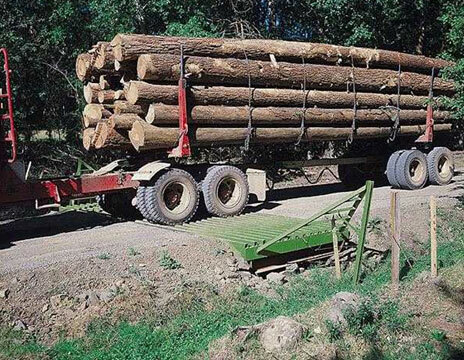 NOTE: Maximum axle load or load class of vehicles are design limits. H 10 is the smallest loading grade considered by the AASHTO classification. © 2005-2019 Information about Cattle Guards. All rights reserved. FAIR USE NOTICE: The information contained on this page may contain images or text that has been released by a 3rd party company or organization to promote their work or product in the media. It is believed that the use of some images and text form this company or organization to illustrate the product, event, or subject in question and where the images are unrepeatable on this site's servers qualifies as fair use under United States copyright law.